When: June 6th – 25th, 2017 Where: Le Bourget Airport in North Paris, France Since it’s first establishment in 1909, the Paris International Air show has been the longest running air show the world has ever seen. It is held every other year at the Le Bourget Airport in North Paris, France. The few days of the event, however, are closed to the general public, as it is strictly for the viewing of those with a professional status. However, the following Friday, Saturday, and Sunday welcomes in spectators of all ages. Here, military and civilian aircrafts from various nations are put out on display for all to see, and even some models are put to the test in aerobatic demonstrations. The goal is to interest potential clients to invest in new brands and prototypes, but adrenaline filled stunts are exciting for all to see. Fans from every age can enjoy the festivities of this incredible event, and not to mention there are more things to do than just watch planes. Booths are set up so spectators can meet with real pilots, try on flight equipment, and kids can even get their face painted. Where: July 11th-17th, 2016 When: Farnborough Airport, Show Centre in Farnborough, UK Similar to the Paris International Air Show, the Farnborough International Air Show exhibits the same spectacular showmanship, but on the English hemisphere. This stunning event combines a major trade exhibition for the aerospace and defense industries with public airshows set to thrill audiences of all ages. Similarly to the Paris International Airshow, the first five days are, unfortunately, restricted to commercial and professional trade, because this show is held specifically for the advancement and advertisement of aircrafts to potential investors and customers. However, the last two days are open for public access. Flights and aerial plane demonstrations take place over all seven days of the event, but most stunts happen during the weekend when civilian spectators can be awed and inspired by the impressive aerobatics. Plus, a traveling funfair for children is also available for additional entertainment during the last two days. When: April 16th-17th, 2016 Where: Knoxville, Tennessee. United States Smoky Mountain Air Shows have long since held one of the largest and most anticipated air shows in the nation. Some of their many famous performers include the U.S. Navy’s C-130 “Fat Albert”, which is an enormously large service plane that carries equipment and support personnel for the Navy’s Blue Angel squad. Alongside this team’s amazing show, Smoky Mountain is also expecting a performance from the Aeroshell Aerobatic Team. This unit, originally formed in 1938, was the first training platform for all U.S. airmen in World War II, and since then has stuck to flying vintage World War aircrafts, which includes a P-51 Mustang. These four planes not only are showstoppers for their classic and historic vibe, but also execute aerial maneuvers in perfect unison. When: June 29th – July 4th, 2016 Where: Battle Creek, Michigan. United States There is a reason why this show goes on for a week, and that is because there is so much happening! Battle Creek Field of Flight is a duo air show that not only hosts those incredible old fashion plane aerobatics and stunt shows, but also prides itself on the countless and colorful balloon displays as well. 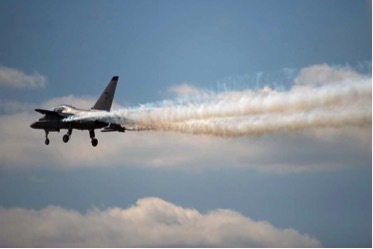 Such favorite maneuvers teams that will be performing include FireBirds XTreme, the high energy and high flying two-ship aerobatics squad, and the world renowned United States Air Force Thunderbirds famous for its synchronized and speedy flybys in military planes like the F-16 aircraft. When: September 14th-18th, 2016 Where: Reno, Nevada. United States The National Championship Air Races have become one of the most popular and anticipated airshows worldwide, bringing in over 150,000 spectators annually from different countries around the globe. 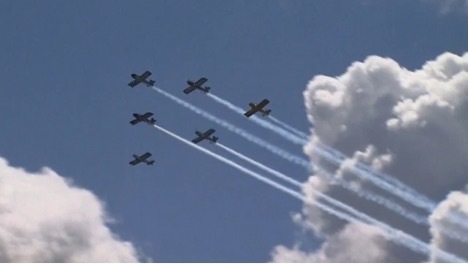 The event features six racing classes, a large display of static aircrafts and vintage models, and several demonstrations that include military shows and civil flight stunts. Not to mention, the famous Blue Angels, the U.S. Navy flight demonstration squadron, is also scheduled to dazzle its audiences during this year’s championship, and Steve Stavrakakis “Wild Thing”, the beloved announcer and European Extreme Style stuntman, is set to make a grand appearance. When: October 15th-16th, 2016 Where: Las Vegas, Nevada. United States If it’s one professional team that knows how to put on a good show it’s Red Bull. Their specialized stunts team performs acrobatics never before seen, breaking the traditional rules of flight and often the speed of sound, which is why it has become “globally renowned as the fastest and most exhilarating motorsport on the plant”, according to the World Air Sports Federation. Each year, a dozen pilots enter in the “Master Class” in 8 races across the world, all striving for the World Champion title. Each pilot also performs daring stunts between each leg of the race at the designated checkpoints. If it’s one professional team that knows how to put on a good show it’s Red Bull. Their specialized stunts team performs acrobatics never before seen, breaking the traditional rules of flight and often the speed of sound, which is why it has become “globally renowned as the fastest and most exhilarating motorsport on the planet”, according to the World Air Sports Federation. Each year, a dozen pilots enter in the “Master Class” in 8 races across the world, all striving for the World Champion title. Each pilot also performs daring stunts between each leg of the race at the designated checkpoints. When: November 11th-13th, 2016 Where: Monroe, North Carolina. United States WarBirds over Monroe puts meaning to its name by hosting countless stunts teams and historic planes all stemming from the U.S. military branches. Sponsors and performers include Dragon Aviation Inc., famous for its reptilian like nose art and fuselage designs, and World War II Airborne Demonstration Team, who parachute out of famous warplanes. However, these stunt teams are not the only attractions to see. This display also gathers local and national aviation museums together to showcase their extraordinary and historical jets and planes that were actually used in combat over our nation’s progression. Not to mention Sky Soldiers may also offer helicopter rides and demonstrations. 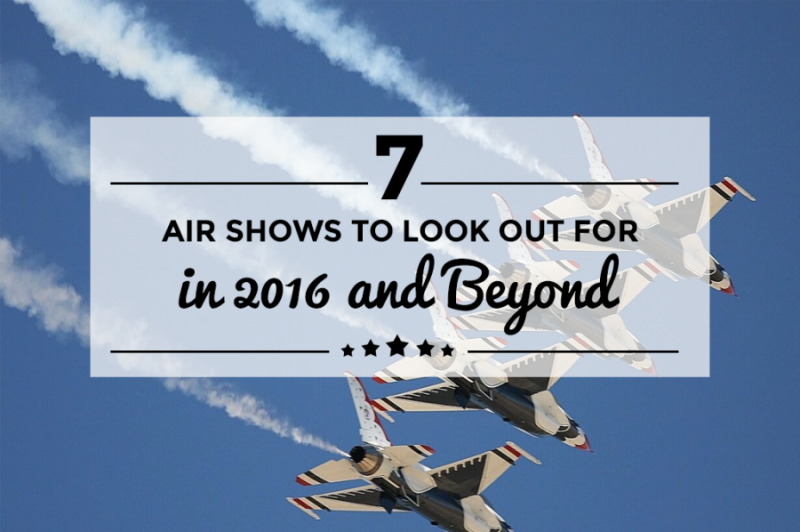 We sincerely hope you are as excited about this year’s upcoming airshows as we are. For countless years, we have celebrated alongside these displays with our enthusiasm and support, and we are looking forward to seeing you there to enjoy the daring stunts of all these exhibitions. 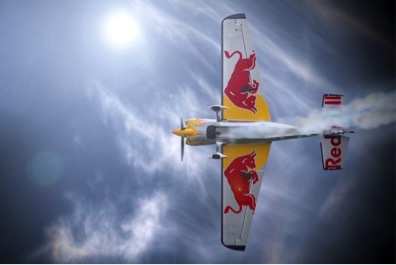 For a complete list of the worldwide air show schedule, click here.